There are 2 main entry points for the Stadium. 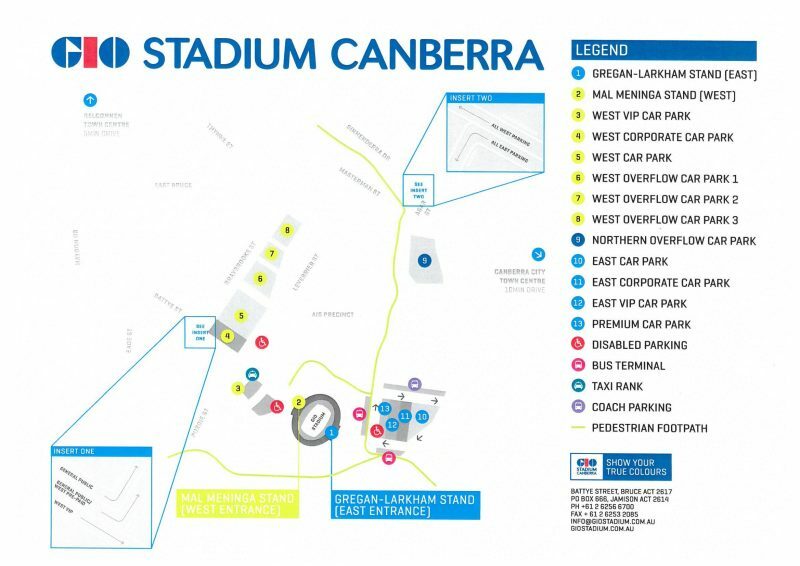 Public car parking is available at a number of locations around GIO Stadium Canberra’s precinct. Car parking is available at a cost of $10.00 (GST incl) per car however fans can take advantage of the new ‘Early Bird Parking Offer’. Fans who get in early and arrive within the first 45 minutes after the gates have opened on match days will pay a reduced parking fee of $7. Please note, cash payment only! Parking attendants present to assist in guiding cars into car spaces. To access the West car park, you turn off Haydon Drive into Battye Street. The East carpark is accessed from Agar Street, off Ginninderra Drive however, this entrance is only available on event days. Patrons are reminded not to leave valuables in their cars as they are responsible for the security of their own vehicles. 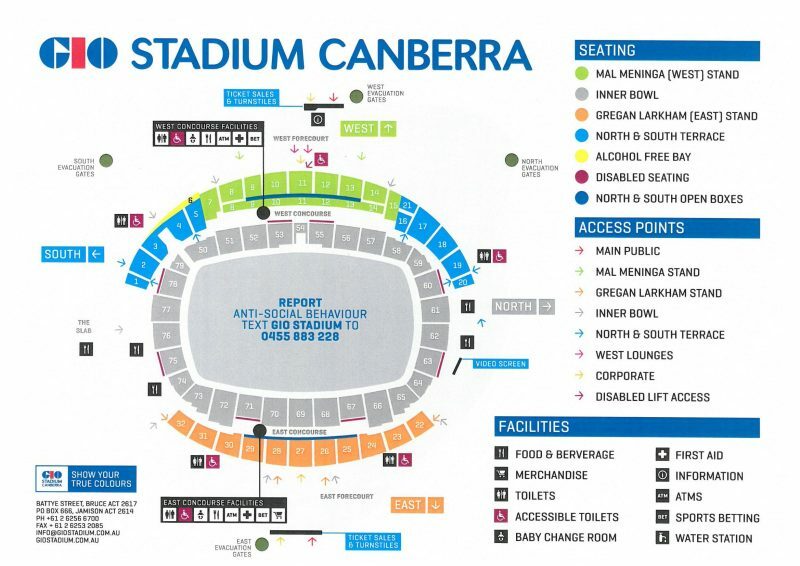 GIO Stadium Canberra does provide limited security in the car parks using mobile security patrols and limited use of the Australian Federal Police. Community “drop off points” exist on the Eastern side of Leverrier St and out the front of the AIS Arena. To access these areas, vehicles will need to enter via the Northern end of Leverrier St from Ginninderra Dr. When arriving or leaving GIO Stadium for a major event (e.g. Raiders/Brumbies match etc.) temporary traffic arrangements are put in place by Venues Canberra along key roads to ensure safe vehicle and pedestrian movement within the Bruce precinct. The changed traffic conditions also are put in place to minimise disruption to local residents in the area. The roads that have altered traffic conditions are Battye, Braybrooke and Masterman streets. 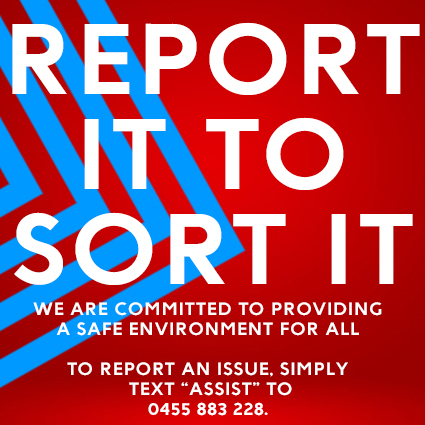 It is the responsibility of all patrons attending events at GIO Stadium to park their vehicles legally, and the responsibility of all patrons to obey the road rules at all times. Please show patience when leaving the precinct due to the increase in traffic and pedestrian activity during major events. When exiting please respect our neighbours. A map of the precinct is available for download (PDF – 322Kb). Transport Canberra Buses, Taxi’s and Ride Share Services are all available on event days.